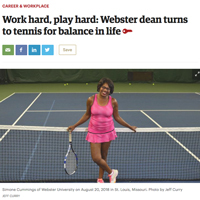 Walker School Dean Simone Cummings was profiled in the St. Louis Business Journal. Simone Cummings, dean of the George Herbert Walker School of Business & Technology, was profiled in the St. Louis Business Journal for the issue released Aug. 31. The profile is called out on the cover of the print edition. Her story is part of the "Life in Balance" series on careers and the workplace, and speaks to Cummings' approach to work-life balance, which includes tennis playing. Subscribers can view the story online here. Share the news on Facebook through this Webster post. The story of WILLOW Project client Angel Stewart's parole, featured last week on St. Louis Public Radio and the Riverfront Times, has now hit news outlets across the nation. An Associated Press story with quotes from WILLOW Project director and Webster University legal studies professor Anne Geraghty-Rathert is appearing in local news outlets and national portals like ABC News and ATT.com's news app, among others. The Legal Studies academic program and the WILLOW Project are based in Webster's College of Arts & Sciences. The WILLOW Project represents women who are post-appeal, incarcerated and believed to have been wrongly convicted of crimes, or victims of abuse in the crimes for which they were committed. "It would be nice to be involved in a case that had not yet resulted in incarceration and perhaps to prevent someone from taking a bad plea or assist them in getting better legal representation,” said Geraghty-Rathert in a 2017 Webster story. Here is one version of the AP coverage of her story. air on NPR's "From The Top." Community Music School (CMS) of Webster University student Jerry Chang, student of Zena Ilyashov, will be featured on NPR's From the Top the week of Sept. 3, 2018. St. Louis' local affiliate, St. Louis Public Radio (KWMU), will air the program on Saturday, Sept. 8, at 7 p.m.
NPR’s From the Top is a nationwide program and initiative to develop and showcase the music and stories of America’s young classical musicians. Jerry Chang was invited to perform for show #356 in Boston. The special live recording takes place during the 2018 From the Top Gala. Jerry performed 2 classical piano pieces on the show: Nocturne in F sharp Major Op. 15, No. 2 by Frédéric Chopin and the Presto agitato from 2 Klavierstücke by Felix Mendelssohn. Chang was also interviewed by NPR’s All Things Considered emeritus host Robert Siegel, sharing a little bit about his hobbies and music stories, which is also part of the broadcast. "Jerry had a great time exploring Boston and meeting new friends. 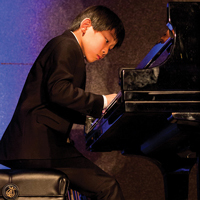 He enjoyed the experience very much" says his mother, Helena Wu. For more information about the From the Top program, please visit www.fromthetop.org.